Mr. Kiichiro Isase, the third secretary of the Ambassador, also was part of the Japanese team that arrived in Kilinochchi by an Sri Lanka Air Force (SLAF) helicopter at 10.30am according to the report. 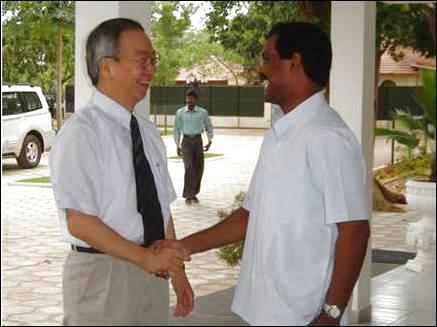 Thamilchelvan told the Ambassador that the LTTE is "exploring other alternatives to deliver the humanitarian assistance to the Tamil speaking people in the NorthEast," and that, "the current political crisis in the South should not hinder the reconstruction, resettlement activities in the NorthEast." Secretary General of the LTTE Peace Secretariat, Mr. Pulithevan, also participated in the meeting. The Ambassador appreciated LTTE's commitment to peace and encouraged the LTTE to continue to adhere to the Cease Fire Agreement. The Ambassador also visited the proposed Kilinochchi Hospital site and teh UNHCR office as part of familiarization tour to acquaint himself with the humanitarian activities in Vanni.